The 5th of November (6pm-8:30pm) sees the inauguration of a unique art exhibition of artists from different parts of India and with backgrounds in varied careers such as fitness, professional ballroom and Latin American dancing, photography, etc, showcasing their artistic talent at Achies Art Gallery, Grandeza, Chandor. Artists from Goa, Mumbai, Gujarat, Coimbatore and Kolkata will be coming together to share their ideas, culture and art with the people of Goa. Aptly titled Melting Pot, the exhibition highlights three exceptional artists of Goan origin: Alex Rodrigues with his finger painted Christian art, visually impaired artist Stacy Rodrigues, and professional carpenter Remidios Antao making his debut in art exhibitions. Alex Rodrigues has made a name for himself with his finger painting and nail art. 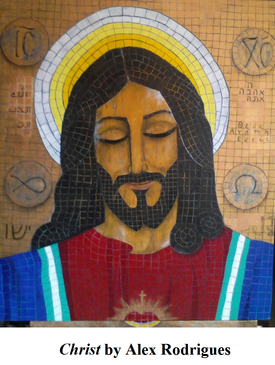 His finger painted Christian art, which will be on display at Grandeza, is created by exclusively using fingers and nails to work out smaller details, while the palm is used for larger surfaces. Alex, who has degrees in electronic engineering and chemistry, has had exhibitions in various parts of India, as well as internationally in places like Australia, Germany, the UK, and others. 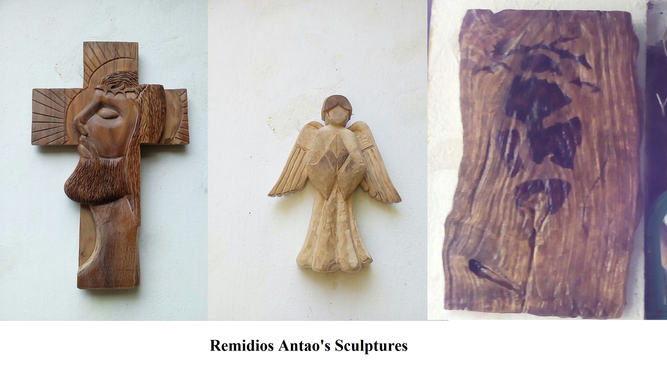 Alex has been instrumental in encouraging Remidios Antao, a professional carpenter who pursues sculpting Christian images as his passion, to exhibit his Christian themed sculptures at Grandeza. Remidios’ grandfather was a carpenter and dabbled in sculpting, producing Christian themed wooden figurines and gifting them to members of the family. Remidios grew up watching his grandfather and, as his fascination with sculpting increased with age, it was inevitable that he too would become a sculptor, while holding on to his profession as a carpenter. Although he does not have a particular style, Remidios sculpts creatively, departing from his conventional woodworking and using mainly waste wood. Remidios first met Alex when admiring Alex’s Christian art at one of his exhibitions. Alex says of his first meeting with Remidios, ‘He and his sister came up to me and expressed their feelings about my works… how they were so inspired by my works… that they just had to come see the show. They said they just wanted to shake hands because they thought it was amazing that I painted all those paintings with my bare hands. Remidios was more taken by the paintings because Christianity is the inspiration for his works.’ Remidios expressed an interest in having his own work on exhibit and Alex promised him the chance of participation in an exhibition. Stacy Rodrigues is another well-known artist, who turned to art as a remedy for her depression after she was diagnosed with heredomacular degeneration. 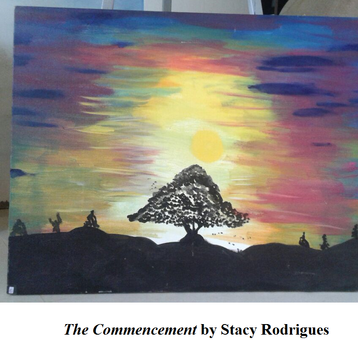 Art revived Stacy’s belief in her own abilities and her self-esteem rose as a result. Today she stands as an example to others of not allowing the pitfalls of life to determine one’s worth and of fighting against the odds no matter the challenge ahead. She will be showing her paintings Winds of Change, The Commencement and others. *The exhibition will carry on to the 9th of November 2016, 11am to 7.30pm. Artists exhibiting: Alex Rodrigues, Celio mascharenhas, Remidios Antao, Stacy Rodrigues, Purnima Dabholkar, Abhilasha Udaygeeth, Shefali Shah, Tejal Mehta, and Kishwar Nensey. Venue: The Grandeza, Guirdolim, Chandor, Salcette, Goa.